I have chosen the following based on a mid size engine frame of 100-200Hp. 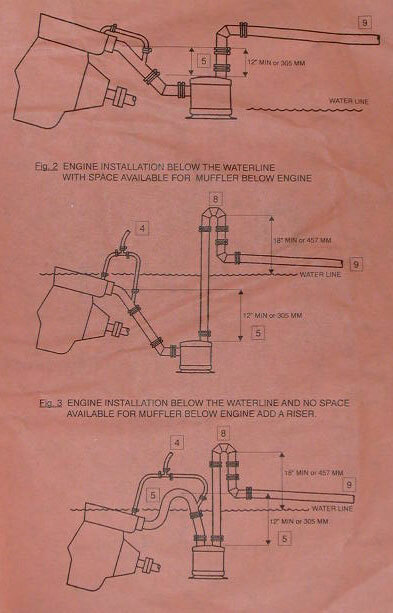 Most of the following applies to all engine sizes, but certain hourly requirments may change depending on engine size. Mainly due to smaller engines having higher rev ranges, thus the hrs tend to be less for certain maintenance schedules. Please compensate to suit your engine size. This is a guideline only. Your engine manufacturer may have a specified maintenance schedule that needs to be followed for purposes of Warrenty. Please ensure you follow your manufacturers requirements, which take priority over this list, or your warrenty may become void. Check Gearbox oil level. Inspect oil for signs of water and burnt (overheated) smells. Check oil pressures when engine is started. Check water trap and ensure raw water is flowing at start up. Check Fuel water trap if fitted. Check Turbo boost pressure if fitted. Every 100-150hrs or 6 months. Drain and replace Engine Oil. Clean Air filter if fitted. Check for oil leaks around engine. Grease Angle drive gear box connection of mechanical rev counter if fitted. Inspect Fuel tank if possible for contamination. Check hose clamps and hoses. Replace Raw water pump impeller. Change engine Anodes if fitted. Change Heat exchanger Anodes if fitted. Have starter motor and alternator serviced. Have Fuel Injectors serviced and calibrated. In some cases, Fuel injector Pump should also be considered for servicing. Have Valve clearances checked and adjusted if required. Check Idle speed and general performance of engine. During winter months, it is always good to regularly start up and run the engine. This ensures a regular wash of oil around the internals to help protect against corrosion. The other time you are warming up, is when you are about to embark on your trip. But there are as many opinions as to how to warm up a Diesel, as there are makes. So just what is the best way to warm up? Well the first golden rule is not to be soft on a Diesel. They are not like a Gasoline engine, which requires a good soft warm up time before any load is applied. The Diesel engine likes to be under load as soon as it can. So here are some steps. 1: Do all pre-start checks, such as ensuring your water and oil levels are correct. 2: Check your dock lines are all tied off properly and check that the dock itself is of the ability to take the pull your vessel is about to apply to it. 3: Start the engine and ensure your oil pressure rises to the correct pressure. Once it has reached correct pressure, which should be just a few seconds, oil should now be pumping through out the engine doing it’s job. 4: Don’t wait any longer. With engine at idle, select forward gear. At this point, check the gearbox pressure if your box and your dash have such a gauge. Then raise the idle speed to about 1000RPM. Most engines will have an idle range a bit lower than 1000RPM. The 1000RPM tends to be a lovely sweet spot to run most engines, but yours may vary slightly, so choose a speed that best suits the boat. This speed will ensure the Alternator is working and that the engine is working a littel and warming slowly. Wait for the engine temp to start rising. The gauge only needs to start lifting, as this indicates the internals of the engine are now quite warm and the sweat can now be produced. If you are actually leaving the dock, then this is the time you can untie and go. Don't wait for the engine to get any warmer, just get going and make it work. 5: Now raise the engine to normal running speed. This should be about 6o-80% max throttle. Allow the boat to pull on the dock lines. They should be just fine. If you break the dock doing this, then the dock would never have been strong enough to protect you in a blow anyway. Tell the Marina manager to make their dock stronger. Keep the engine at this speed till the engine temp is at normal operating temp. You can now leave the engine at this RPM for as long as you want. But the next step takes special care and a careful watch by you. 6: You can now raise the RPM to max and watch for the engine to produce abnormal quantities of black smoke. As soon as you see this, back off the RPM slightly to stop the smoking. This is your maximum safe operating RPM. In some situations, the engine temp may rise above normal. Keep a careful watch on that and do not allow it to over heat. If an alarm happen to go off, reduce back to idle, but DO NOT stop the engine. You must keep water circulating to cool it. Don’t worry about the alarm, it will turn off eventually. Diesels can take a lot of heating before any damage is done to them. You can run the engine at this elevated RPM for just a few minutes. It ensures the engine gets a good hard load and working time. DO NOT LEAVE THE HELM while you are carrying out this part of the run. Keep a careful watch on dock lines, ready to cut the engine in and emergency. 7: Now you can safely bring your engine back to idle and allow temps to return too normal. It is good to run the engine for a few minutes at idle to ensure all internal area’s are cooled correctly and evenly before shut down. 8: You can now stop the engine, mission over. For those that want to know everything about your engine oils, click on the link. The info is great and I could never do it justice writing the info myself.